Three people have been found guilty of supplying thousands of cannabis-laced chocolate bars to multiple sclerosis sufferers for pain relief. Mark Gibson and his wife Lezley, both 42, of Alston, Cumbria, were standing trial at Carlisle Crown Court with Marcus Davies, 36, of St Ives, Cambs. They were convicted of two counts each of conspiring to supply cannabis throughout 2004 until February 2005. 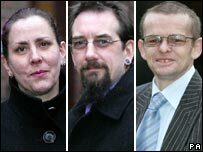 All three were ordered to return to court on 26 January for sentencing. The Cumbrian couple admitted running a cottage industry making and posting out more than 20,000 Canna-Biz bars containing about 3.5g of the drug, to victims of the disease around the world. Bringing ill people to court and torturing them like this isn't what you do. But in their testimonies they both insisted this was a free service funded by voluntary donations, which was only available to MS sufferers who provided a medical note confirming their condition. Davies admitted running a website and post office box, but had denied any involvement in making or posting the chocolate. Cash receipts totalling £30,000 were seized by police, but the court heard Lezley Gibson told officers these referred to donations, which were ploughed "straight back in" to fund the Canna-Biz operation. All three told the court they believed they had a defence of medical necessity in supplying the cannabis-laced bars, but this was rejected by the jury. After the hearing Lezley Gibson said: "The maximum sentence for what we've been found guilty of is 14 years in jail. If you were a child pervert your maximum sentence is only 12. "I think there's a mistake in the law, and I think they really, really really need to re-think the law on cannabis and medicinal use. Bringing ill people to court and torturing them like this isn't what you do. "You look after ill people, and you try to make them better. You do not torture them and drag them back and forward to a court of law."